Zin is sadly underrepresented on this site. Here's to remedying that. The folks at the Purple Wine Company hosted a Twitter event with accompanying wines and a live video feed with winemaker Britt Moore and Lisa Ehrlich, VP of Marketing. Always fun. The theme? 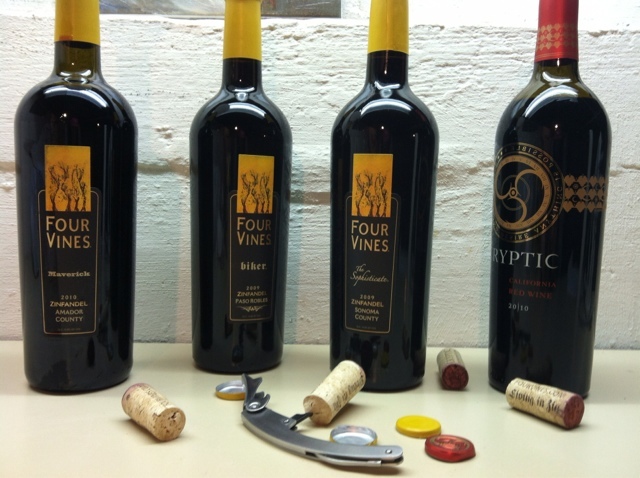 Big, bad Zins from Four Vines, plus a brand new wine from a label called Cryptic. Let's get right to it. All these monsters clock in at 14.8%, but they don't all reflect it the same way. Each is sourced from different appellations, and do show it. If you're looking to narrow this short list down to one, "The Sophisticate" wins on all quality points. It's got polish and guts and substance all wrapped up in a smooth package. "The Maverick" (not just for the few remaining Sarah Palin fans out there) is a close second. Sourced predominantly from Dry Creek Valley - this is ground zero for real Zin - and it shows in its structure, lovely stature, and seriousness. Balance and unabashed grip strike a pose in what is easily the most poised (but not meek) of this line up. Real Zin has made a cameo appearance in the 21 century! Some heat and pepper on the attack signal textbook Zin. Bright blue fruit beams a straight line to the efficient finish. Tannins are ever present, suggesting that this could benefit from a little relaxing in the bottle. After a couple of hours of air time, its stitching loosened up and the fabric of flavors unfolded. A transformation into something lovely. This is what Zinfandel has become known for - except that it's done well. Bombastic dark fruit, again with the grippy tannins, and a finish that lingers in gentle aftershocks. Wow. A real surprise here, such balance and soft texture given the deliberately brash approach. You like your Zins spicy and swaggering? Here you go. Teetering on the brink between the sweet red movement and an Zin-based, Amarone stylized wine, this new bottling might be struggling with a bit of an identity crisis. That said, the building blocks to make a noteworthy wine are here: black fruit that digs deep, coarse texture, and enough oak/acid to prop it up with structure. Its first incarnation, however, appears to be seemingly targeted at the Prisoner-loving crowd.